KPA Strategic Force Commander General Kim Rak Gyom issues orders during the mobile ballistic missile test on March 11, 2016 (Photo: KCTV screen grab). Kim Rak Gyom (Kim Rak-kyo’m) is commander of the Korean People’s Army [KPA] Strategic Forces (formerly known as the KPA Strategic Rocket Forces) and a Member of the Workers’ Party of Korea [WPK] Central Committee. General Kim is a ballistic missile and aeronautics expert. He has held command positions in the KPA General Staff Ballistic Missile Bureau and KPA Artillery Command. He was appointed as a deputy commander of the KPA Strategic Forces in April 2007. He was appointed commander of the KPA Strategic Forces during February 2012, replacing Choe Sang Ryo. General Kim appeared alongside Kim Jong Un on March 2, 2012 when Jong Un visited the KPA Strategic Force headquarters in Kangdong County, Pyongyang, to mark the annual treeplanting day. Kim Jong Un talks with KPA Strategic Rocket Force commander Col. Gen. Kim Rak Gyom and the SRF’s vice commander (Photo: Rodong Sinmun). Kim Rak Gyom spoke at an April 25, 2013 meeting marking the KPA’s official anniversary, along with other senior DPRK military command staff. On February 15, 2014, he was promoted to three-star Colonel-General (sangjang) in military promotions orders issued on late DPRK leader Kim Jong Il’s birth anniversary. During 2014 and 2015, General Kim supervised several missile tests and drills, including live fire drills during July 2014. He received his fourth star to General (taejang) between 2015 and 2016, but his effective promotion was not disclosed in DPRK state media. In 2016, Kim Rak Gyom attended a briefing and inspection of some of the DPRK’s nuclear weapons assets by Kim Jong Un held in March at the Ta’eso’ng plant between Pyongyang and Namp’o. Two days later, General Kim was present and issued orders when Kim Jong Un attended a mobile missile drill in North Hwanghae Province. During April 2016, he attended the test firing of an intercontinental ballistic missile engine at the Sohae Space Center in Ch’o’lsan County, North P’yo’ngan Province and later the same month, attended and issued orders, again in Jong Un’s presence, during the test firing of a submarine-launched ballistic missile off the coast of South Hamgyo’ng Province. Kim Rak Gyom was elected to the WPK Central Committee during the 7th Congress of the WPK (7th Party Congress) in May 2016. 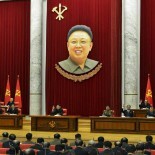 During the 7th Party Congress he was removed from the WPK Central Military Commission. General Kim’s removal from the Central Military Commission was erroneously interpreted as punishment for a series of failed tests of the Hwaso’ng-10 (Musudan) intermediate range ballistic missile [IRBM]. In fact, several senior KPA commanders with equivalent command positions, were removed from the CMC at that time. On June 22, 2016 attended the successful test firing of the Hwaso’ng-10. At this hour, when we are splendidly celebrating the meaningful Army Founding Day with the respected and beloved Comrade Supreme Commander at hand, all the officers and men of our Strategic Rocket Forces are full of burning resolution to by all means achieve final victory in the life-and-death decisive battle with the enemies following the leadership of Comrade Supreme Commander. Looking back, by unsparingly carrying out the country’s first work for the country’s foundation for the reinforcement and development of the Strategic Rocket Forces, for which the fatherly leader made the first step, despite the severe period of whether it is rice or bullets, the great general energetically led us to produce and develop more various missiles of our style. The respected and beloved Comrade Supreme Commander saw that the powerful nuclear missiles, which the great generalissimos prepared by dedicating their whole lives, were deployed for actual warfare at the units, and in March, made the final review and ratified the Strategic Rocket Forces’ firepower strike plan that will pour a fiery shower of nuclear retaliation on the heads of the enemies. The respected and beloved Comrade Supreme Commander proposed a new line on simultaneously pushing forward economic construction and the building of nuclear armed forces and prepared a legal guarantee that can strengthen the nuclear armed forces of our style many times over. By doing so, he saw that we fully settled the anti-US war of confrontation and our Republic further shone as a nuclear power. The respected and beloved Comrade Supreme Commander! We, the Strategic Rocket Forces, do not count those like the puppet gang of traitors and the Japanese reactionaries. The dens of the brigandish US imperialists, including the White House and the Pentagon, Hawaii and the island of Guam, are entered as the first targets to strike in each of our intercontinental ballistic missiles and the officers and men of the Strategic Rocket Forces currently have their hands over the lift-off button. Our cause is the cause of justice and our nuclear armed forces are nuclear armed forces of justice to protect our sovereignty and dignity. If the US imperialists and its follower forces dare to deal a blow, the US imperialists will shudder by getting a real taste of nuclear war and real taste of fiery lightning and the puppet gang of traitors that are rashly running amok while acting as an agent of the US imperialists and the Japs of the island country will also severely suffer a bitter taste of terrifying ravages of nuclear [war]. We, who grew up into the world’s strongest armed forces of the Strategic Rocket Forces, firmly make a resolution to completely wipe out the bastards not giving any one of them a chance to stamp a seal on the surrender document by pouring a merciless fiery lightning of retaliation, a fiery nuclear lightning of justice over them, and by all means achieve the historic cause for the fatherland’s reunification once the respected and beloved Comrade Supreme Commander gives orders.